We have to keep reminding ourselves of this advice as we nibble our way through what’s turned out to be a monster project. Especially as we seem to have taken on an elephant that likes to waltz. For every step forward we seem to take one back and a couple sideways. 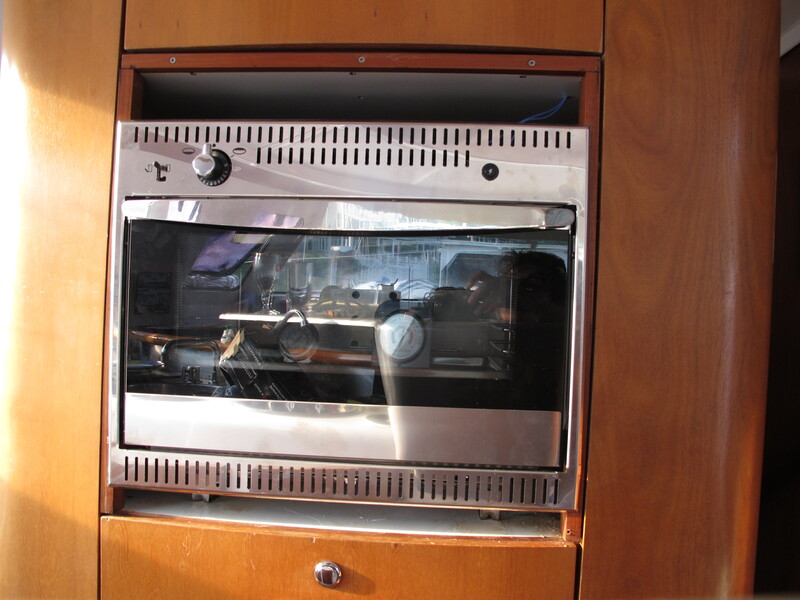 For instance, our new (undamaged) wall oven arrived last week. It’s the same brand as the old one (in fact it’s the only LPG wall oven on the market), so it shouldn’t be too hard to install. But the manufacturers in their wisdom have made the new model 5” shorter than the old one (see, we’re getting the hang of this imperial measurement stuff again). And the gas fitting is also a smaller diameter than the old one. So now we have to change fittings and possibly hoses AND find some timber facing board to fill in the gaps. It’s starting to feel like we’ve bitten off more of the dancing elephant than we can chew. New fresh water pump installed, new hoses fitted. No more leaks! The water tanks are finally cleared of the disgusting pink antifreeze after many flushes and addition of water purifier. 5 new deck hatches installed. All four cabins and companionways repainted. Additonal 110v and 12v outlets wired in. Two new engine tachometers installed. We’ve also fitted out the galley and cabins with new utensils, crockery and bedding, as what was left on the boat wasn’t fit for human consumption. Hmmm, we’ve had a bit on it seems!! (And the plastic has been getting a serious workout). I’m in absolute awe of Bruce – he’s done all the installations himself, most of them entailing much crawling through impossibly small spaces in the heat and humidity. (I’m convinced boat-builders are a particularly sadistic lot who like to make it as hard as possible to get to the vital access points, even on a big catamaran). Much as I’d like to say that Bruce also completed these tasks with a smile on his face and a song in his heart, I can only report that he’s well and truly safe from being canonized any time soon – his already extensive vocabulary of swear words has grown exponentially in the last 6 weeks! We’re hoping there’s light at the end of the tunnel, but……still on the list is getting the water-maker operating (or buying a new one), installing holding tanks and the new anchor windlass, replacing one solar panel and 2 more hatches, installing new running rigging and the new trampoline netting (if it ever arrives), making new mattress covers for all cabins, buying the BBQ and LPG tank (can’t have an Aussie boat without a barbie!! ), repairing the genoa, getting a new bimini cover made (didn’t think I could tackle that one), installing a new mainsheet traveler car, getting the life-rafts serviced, organizing safety equipment and medical kit and so on, and on……oh, and trying to find a secondhand spinnaker for all that downwind sailing we’re hoping to do. Eventually. We might get off the dock one day. Let’s hope it’s before the end of October! Thanks Pen! Yes, it definitely feels like an uphill slog! We’re in awe of you guys. You are amazing!constantly thinking of you. Thx Sherm – just wish we were 20 years younger! My goodness you have been busy and there seems still lots more to do. I expect it’s all worth it. You got ad mention at first Friday cruising dinner last night. Has the remote arrived it was posted 10/7. Thanks Jackie – yep, still lots to do! No sign of the remote yet – is taking it’s own sweet time I guess. Yes Linda – sweating it out the pores, steam coming out of the ears, and lots of blue air out of Bruce’s mouth lol !